When back in June Apple announced sticker packs for iMessage at the WWDC as part of iOS 10, I was immediately fascinated by the idea of trying to release one. I really wanted to create my first sticker pack themed around the thing I’m most passionate about: astronomy. I’m currently studying astronomy and wanted to share my passion with fellow iMessage users! It’s a great way to interact with friends and it also has educational potential. 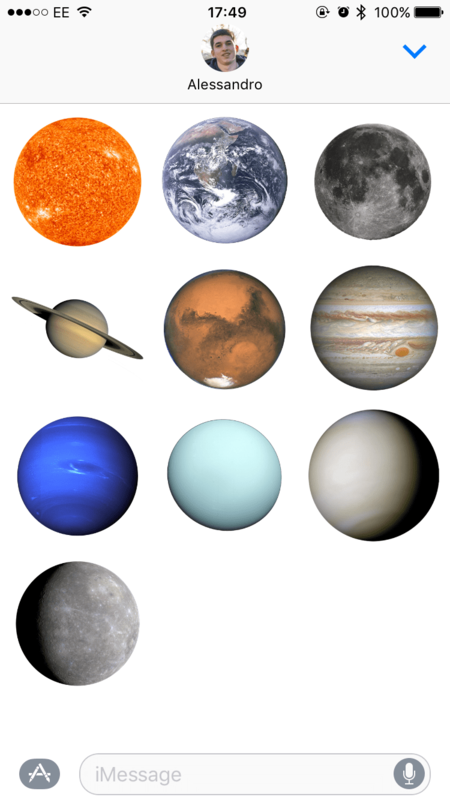 The pack contains the main bodies of the solar system: the Sun, the Moon, and all the planets (sorry Pluto!). The sticker pack can be downloaded on the App Store from here. Just over a month ago I spent a week in the Bay Area. For the first five days I resided in Palo Alto (I attended an astronomy conference at Stanford) and then I spent the weekend in San Francisco. It wasn’t obviously enough time to get a real idea of the place and to understand how it would be to live there (also, this piece won’t take into consideration the big variations that must exist from place to place in the Bay). However, I wanted to write down some initial personal contrasting impressions and sentiments regarding the region in the world that most contributes to bring forward the tech sector . My thoughts below will be mostly sparse and limited (thus mainly a bullet point list), and possibly incorrect, but definitely honest and genuine—I recorded them in my Notes app as they came to mind (some editing and details were applied at a later stage; some points were also discussed with a couple of other British researchers who stayed with me during my time in the Bay). I will try to read more about the area in the future to correct the likely misconceptions, but I thought it was interesting to put down in writing the initial impressions that a European visitor may get. I generally don’t like this kind of post, but it’s been quite a while since people have been discussing whether Twitter has a prosperous future ahead. Now I have come to think that Apple should buy it in order to make it an exciting product that doesn’t need to please Wall Street investors. I believe there are at least two good reasons for this acquisition to take place.